A small central lane, a quasi-private passage threaded through the more public perimeter, serves as the entry for the duplex flats above the shops. Designed around a central courtyard on the first floor, the once-residential flats have panoramic views of the market from their terraces. 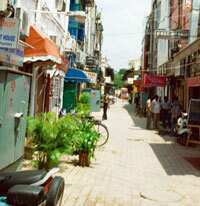 Khan Market’s rapid gentrification, coupled with New Delhi’s aggressive demands for “prime commercial space", irreversibly altered the equation for the original residents. Their exodus has spawned other commercial outlets in these flats. Despite recent security alerts and bomb scares, the vitality of this market asserts itself as a confident and essential antidote to the tribulations of our times. One could argue that the rise of the shopping mall is an appropriate reflection of the aspirations of the rising middle class. Indian consumers seem to favour the climate-controlled comforts of browsing within glass-fronted facades. Ample underground parking, gleaming corridors and clean public toilets undoubtedly contribute to a better shopping experience. And yet, with very few exceptions, the architecture of these new buildings appears hermetic—intent upon excluding the city and its textured landscape from the space within. If the open bazaar presents a democratic public domain for all citizens, the mall demarcates a precise economic zone for the empowered. And an optimal architectural typology for modern Indian retail remains elusive. The recent revival of the American downtown owes much to the escalating environmental and social problems associated with suburban sprawl. Civic agencies, working in partnership with citizens-advocacy groups, worked to revive urban “downtowns" with better intra-city transportation and public services. American citizens are once again discovering the pleasures of city life where affordable living, working and shopping destinations are all within a short commuting distance. Functioning as an arena for multiple modes of interaction and exchange, the bazaar thus remains a catalyst for energizing city life. The success of the traditional bazaar owes much to its unrestricted vision of commerce and its proximity to residential colonies. Serving multiple economic strata with an array of goods and services, the bazaar creates a public realm defined by the ordinary and everyday needs of urban citizens. Even as municipal agencies neglect the urgent necessity for civic infrastructure, and a handful of patrons nourish the cultural and intellectual life of our cities, the market continues to act as a dominant community anchor. In creating a sense of place and promoting historical continuity, the bazaar compels citizens to extend their civic responsibility to the public domain. Pankaj Vir Gupta and Christine Mueller are partners in the firm vir.mueller architects and are currently based in New Delhi.